Due to the excessive length of the original article, I have decided to post the overview. For those interested in entire design process and thinking behind the FLX, full article can be found here. This entry was posted on August 3, 2014 at 7:45 am	and is filed under Uncategorized. Tagged: air superiority, fighter, overview, proposal. You can follow any responses to this entry through the RSS 2.0 feed. You can leave a response, or trackback from your own site. Can it carry ASAT Weapons? Also I didn’t know you played tom clancys endwar! I didn’t play either of these. In End War the European Federations fighter is the Hailstorm which is basically a single engined Rafale. It’s mentioned that the variant you see in game is a modification of the air-superiority version. Excuse for being used in ground attack role is that they can be upgraded to use turreted lasers. Looks excellent… maybe they got inspiration from Novi Avion? Maybe. 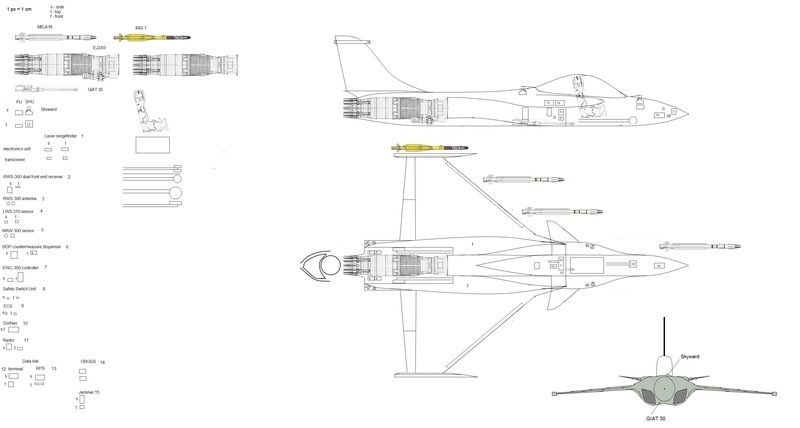 But more probable is that they tried to make a European Fighter that suggest cooperation between France, Sweden and whatever Eurofigter countries remain in the European Federation (UK is mentioned to have left), hence they bashed together the forward section of the Rafale, wing of the Rafale, Gripen and Eurofighter, canard reminiscent of Eurofighter placed in a more forward position but still close enough to be close-coupled, one engine like the Gripen and back section and stabilizer similar to Rafale and maybe Eurofighter. Hi great blog I’m impressed. But Picard have you know that ultraviolet based MAW has one big drawback opposed to IR one? I’m talking about that UV can’t track target which engine propellant burned out so in the worst part of evading missile. I would rather took IR based french DDM system for FLX. I have nice passive system comparison document done by SAAB(unfortunately link don’t exist anymore but i can send it by e-mail if you are interested. MAW-300 is planned in both UV and IR versions, IIRC. But main reason I didn’t use DDM is that I didn’t have any data I required on it (such as weight and dimensions). And yeah, that document would be nice. Ok give me e-mail and i will send it. So here’s a question that would go against your doctrine of single role only, “not a pound for air to ground”. If you were running a multirole fighter program, how would you go about it? – Would you do it like the French, start with a naval fighter for air superiority and E-War, then sell a stripped down one to the Air Force? – Would you do it like the English/Germans/Italians; start with an air superiority/interceptor fighter, then try to cobble on A2G? – Would you do it like the Americans with the F-35? Or the Americans with their F-5? – Would you do it like the Swedes, emphasising iteration, low logistical impact, but nevertheless provisioning for A2G weight growth? – With new technology like the pulse detonation engine that offers high efficiency in all speeds from takeoff to mach 5, what does the prospect of multirole look like then? Planforms like the Oblique wing? Tiltjet/Tiltwings? Why is that in the the procurement for an air force, that multirole aircraft have such an appeal that every country in the world has adopted this doctrine? Is it cultural, monetary, logistical? I would design an air superiority fighter optimized for carrier and dirt strip/road base ops, and then see what changes are necessary for ground attack. And then sell the stripped down version to the Air Force. So about a halfway between Gripen and Rafale. All of it. Cultural because multirole fighters mean that they get to do both of their preferred missions – air superiority and strategic bombardment – with the same platform, and it also gets them out of the hated close air support mission. Monetary because multirole fighters, while more expensive, are cheaper than maintaining fleets of single-role fighters (you’ll notice that even my designs are actually multirole, though all the roles in question are of the same “family” as opposed to widely divergent roles of modern multirole aircraft). And logistical because it is easier to transport supplies and train people for one type of aircraft. That being said, I’m not sure wether these gains really exist versus my proposal since multirole fighters are far more complex than my concepts would be. Going to an extreme in either direction is not good. What are your thoughts about adding some conformal fuel tanks to this fighter where range is needed? Conformal fuel tanks would probably make it too fat and restrict vision. Besides, they are typically used by multirole fighters, as bombs cut flight range a lot and fuel tank hardpoints are needed for bombs due to their heavy load. So it is possible, if necessary, but I don’t see much need for it. I was thinking for very long range operations or for extended supercruise operations. The effective fuel fraction would be higher, perhaps well over 0.45, allowing for a very long range or more time spent at supersonic speeds. They don’t add as much drag as a drop tank would, but on the downside of course, they cannot be dropped (unless someone invents a drop conformal fuel tank). The FLX should have similar advantages and be able to take off field. Indeed. Road basing capability is a minimum survivability requirement for a fighter aircraft, any fighter without it is essentially useless.